With this letter, hopefully you all have escaped the final wisps of the Winter doldrums and Spring is well underway. The new governance structure of ISER is being phased in, per changes to the Bylaws approved by the ISER membership, as planned. New leadership roles for Vice-Presidents, committee Chairs, and the Secretary have been articulated, and the committees have been engaged actively in their respective roles over the past several months. My particular thanks go out to Ernst Tamm (Vice-President/Europe; Chair, Fundraising Committee), David Hyde (Councilor/Americas; Chair, Membership Committee), and “Jerry” Lutty (Vice-President/Americas; Chair, Communications Committee) for their efforts in guiding their respective committees, as well as to the committee members. In addition, Tailoi Chan-Ling (ISER Secretary, and Co-Chair, Mentoring Committee) and Patricia D’Amore (Co-Chair, Mentoring Committee) have been spearheading new efforts to engage young investigators and trainees-- especially women-- in ISER’s mentoring program. I encourage you to read the reports from each of these Committee chairs, below, in this and future Newsletters. The ISER XXII Biennial Meeting (Tokyo, Japan, September 26-30, 2016) is taking shape nicely as well, under the outstanding leadership of Takeshi Iwata (Vice-President/Asia-Pacific; Chair, Program Committee) and John Penn (Meeting Liaison, and ISER President-Elect). Section Organizers have been chosen, who in turn will oversee the Session Organizers for the meeting. K.I.T. Group GmbH (Berlin, GE) has been selected as the conference management firm. The meeting will be a key agenda topic when the ISER Council meets in May, immediately prior to the annual ARVO meeting in Denver, CO.
You will notice a new feature in this Newsletter: the “Kudos!” column. This is a place where ISER members can receive special public recognition for their professional accomplishments-- major awards, promotions in rank/tenure, and other “newsworthy” items. In this regard, I’d like to make special mention of Patricia D’Amore, ISER member and longtime significant member of the vision research community, who will be receiving the prestigious Proctor Medal at the 2015 ARVO Annual Meeting this May. Kudos! As in prior Newsletters, I encourage you to consider becoming more actively involved in ISER, in its governance structure (as openings become available), in the relatively recently launched Mentoring Program (either as a mentor or mentee), and in the Lab Exchange Program (consider submitting a “lab profile”, e.g., as shown below). We want to hear from you regarding your needs as an ISER member and what additional features you’d like ISER to consider offering to its members in the future. In closing, I’d like to pay special tribute to David C. Beebe (Janet and Bernard Becker Professor, Department of Ophthalmology & Visual Sciences, Washington University in St. Louis)-- a highly distinguished and eminent vision scientist, longtime active ISER member, and valued colleague and friend-- who passed away on March 27th from complications associated with a chronic illness. The vision research community mourns this significant loss from our midst. On a brighter note, I wish you all a very happy and healthy Spring! ISER’s Communication Committee will publish an “Eye Photo of the Quarter” in each quarterly newsletter. The first Eye Photo of the Quarter is shown below from Dr. Nicolás Cuenca, Departamento de Fisiología, Genética y MicrobiologíaUniversidad de Alicante. We are soliciting scientific images that are visually exciting and scientifically compelling for each edition of the newsletter. Your scientific image, in TIF or JPEG format, should be accompanied by a “figure legend” explaining what the image is, how it was done, and who captured it. The legend can also include a reference (link) to the published study associated with the image. So as not to violate copyright, please choose an unpublished image. The Communication Committee will select the most exciting photo each quarter to publish in the newsletter. We are pleased to announce that all ISER members will be enrolled in the new Eye2Eye member’s only discussion forum! We hope that you will find this member benefit to be an informative, useful and professional tool. ISER’s Eye2Eye Discussion Forum is an open forum where ISER members can ask a question, request feedback, and discover new resources! Find out how others are resolving challenging issues, contribute to your colleagues' body of knowledge, and expand your own knowledge through shared experiences and ideas. You’ll receive another message from ISER before the forum goes live. Please stay tuned and watch your inbox for important information about ISER’s Eye2Eye. 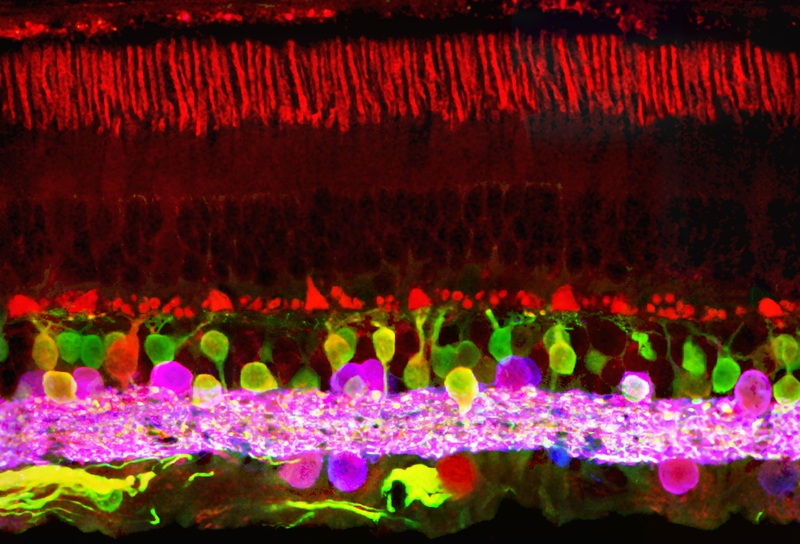 Using confocal microscopy it is possible to observer the beauty and complexity of the retina. The main cell types and interconnecting networks of a monkey retina are clearly labeled with specific antibodies for each population of neurons. This technique allows us to discover at the microscopy level the surprising texture and shape of neurons, their variety and their exquisite cell organization. The three primary colors of the fluorophores combine to generate a rich assortment of colors at the sites where the labeled proteins co-localize. Each color labels a cell type population of neurons that have a specific function in visual processes. We used three primary antibodies which recognized the protein alpha-synuclein (red), which stain axon terminals and outer segments of cones and rods and a specific population of bipolar, amacrine and ganglion cells. Also, GABA (blue) and glycine (green) were used which labels amacrine and bipolar cells respectivelly. The detailed knowledge of retinal structure and synaptic connectivity that emerges from studies combining the use of confocal microscopy and immunohitochemistry is proving invaluable in increasing our understanding of the operation of the normal retina and furthering our understanding of degenerative diseases of the retina and their mode of action. The Fundraising Committee has convened by conference call and established a strategy for contacting potential sponsors. Some of those have already positively responded, but have specific request with regards to sessions sponsored, etc. These issues will be discussed at the next council meeting at ARVO. For those who may have personal contacts with potential corporate or individual sponsors, please contact the ISER office (mail@iser.org). The Membership Committee met “virtually” (via emails and conference call) to discuss ways to increase the number of ISER members, especially in the years between the ISER Biennial meetings, and what additional benefits might accrue for ISER members, especially Young Investigators, beyond those already offered. For the former, the Committee felt that the easiest solution would be to offer a simplified two-year membership structure, the application for which could be submitted anytime and be applied for two consecutive calendar years. For the latter, our discussion focused on the development of a number of social media-related features, such as specialized electronic discussion groups and the recording and archiving of the keynote and named lectures at the ISER Biennial meetings, so that they can be viewed by members at any time. There also was some discussion regarding the topic of “off-year” meetings (i.e., in the years between the ISER Biennial meetings), including innovative ways to ensure that these meetings are at least cost-neutral to ISER, such as holding the meetings at university campuses, utilizing their teaching, housing, and food service facilities. These and additional ideas from the Membership Committee will be discussed during the May ISER Council meeting, which will take place immediately prior to the annual ARVO meeting in Denver. I encourage all ISER members who have ideas on how to increase membership at all levels and to retain those memberships in the years between the ISER Biennial meetings to please forward them either to myself (dhyde@nd.edu) or to the ISER office (mail@iser.org), with Subject line “Membership Committee ideas”. Congratulations to the following ISER members for these outstanding professional accomplishments! Xiuqian Mu, MD, PhD (Departments of Ophthalmology and Biochemistry, School of Medicine and Biological Sciences, the State University of New York at Buffalo) was recently promoted to Associate Professor with tenure. 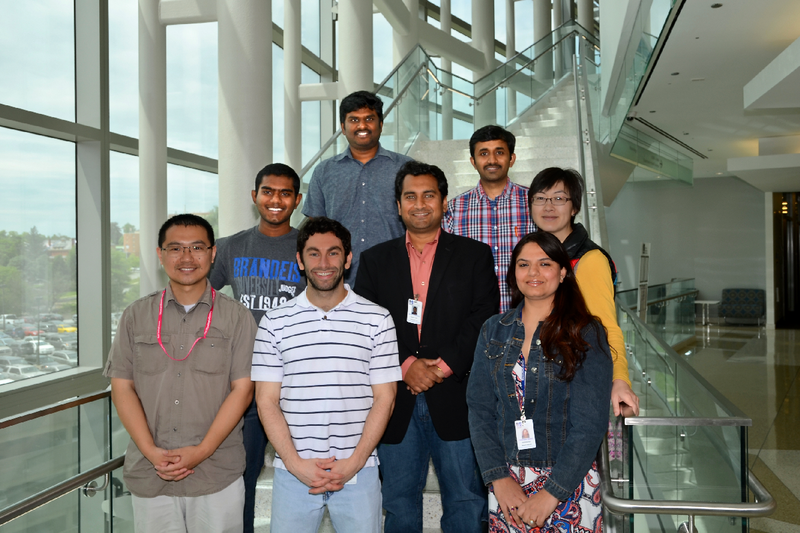 Mu works on the roles gene regulation plays in mouse retinal development, particularly in retinal cell fate specification. 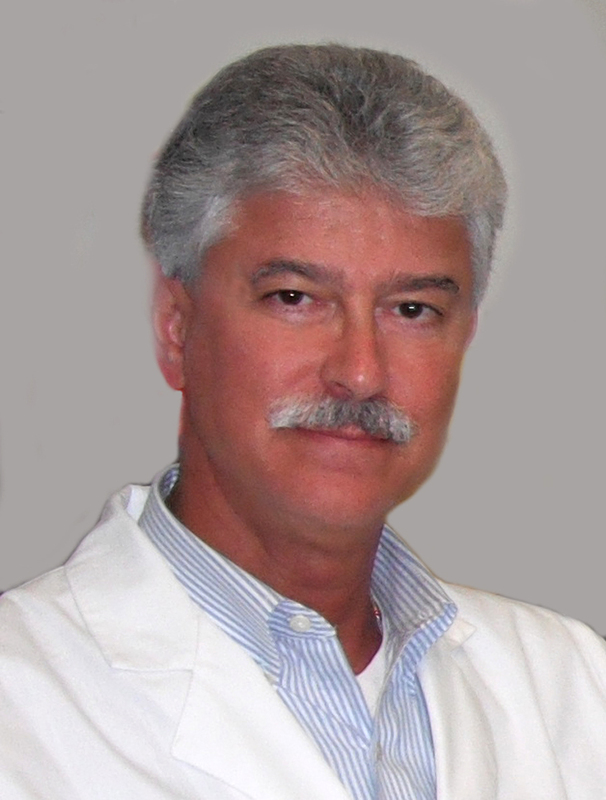 Steven J. Fliesler, PhD, FARVO (Departments of Ophthalmology and Biochemistry, School of Medicine and Biological Sciences, the State University of New York at Buffalo) received a SUNY Chancellor’s Award for Excellence in Scholarship and Creative Activities as well as being named a UB (University at Buffalo) Distinguished Professor. These honors were officially conferred at the “Celebration of Excellence” ceremony on October 8, 2014, at the University at Buffalo. He was also the Keynote Lecturer at the 2015 PRO RETINA Potsdam Colloquium on Retinal Degenerations (March 27-28, Potsdam, Germany). The title of ARVO Fellow is an honor established to recognize members for their individual accomplishments, leadership and contributions to the Association. Following on the success of our inaugural WISER (Women of ISER) dinner in San Francisco, WISER will be having a second dinner function on Wednesday evening at ARVO 2015 in Denver, Colorado. This meeting is expected to be particularly helpful in future mentoring of new or aspiring new investigators (female and male) seeking to advance their scientific careers. Graduate students and post-docs were invited, along with senior investigators with an interest in guiding and mentoring our future generation of eye researchers. We have reserved a private room at Maggiano’s Little Italy for 40 people so that we can more easily discuss issues. Following the dinner, those interested can relocate to a nearby lounge for further discussion. The cost of the dinner is $38.95 per person (plus taxes & gratuities), and includes three courses, rolls, coffee, tea, and sodas. Alcoholic beverages are available at additional cost. All places are now filled. Registered attendees for this function will receive an email soon with further information. The XXIIth ISER Biennial Meeting will take place September 26-30, 2016, in Shinjuku, Tokyo, Japan. The local organizers, Dr. Takahisa Furukawa and myself, and the Executive Committee members of ISER are working at every level on preparations for this meeting. The venue has been decided to be the Keio Plaza Hotel (http://www.keioplaza.com/), located in the Shinjuku business district across the street from the Tokyo Governance Building. This is one of the most popular and accessible areas in Tokyo, with a number of hotels and department stores in the same location. The oral presentations will take place in rooms on the 4th and 5th floors, while the poster sessions will be held on the 43rd floor, which has a magnificent view of Shinjuku. On December 10, 2014, we had a conference call to interview a variety of meeting management companies for the 2016 meeting. After hearing their presentations and then discussing the pros and cons of each, a German company-- K.I.T. Group GmbH-- was selected. The company has experience with managing many international meetings and provides the most technically advanced service for conference management, organizing presentation schedules and abstracts on computers and hand-held devices ("smart phones", tablet computers, etc.). The Organizing Committee intends to complete the selection of sessions and the majority of platform speakers by the end of this year, and then focus on the promotion of the meeting. Any new ideas for the coming Tokyo meeting are welcomed. You can send an email to the ISER Office at mail@iser.org or directly to the local organizer at iser@kankakuki.go.jp. We look forward to hearing from you. Are You Attending ARVO 2015? We are seeking volunteers to represent the society at its exhibit during the 2015 ARVO Meeting. ISER's exhibit will promote the ISER XXII Biennial Meeting in Tokyo, Japan in September, 2016. We will distribute membership materials, and offer information about our unique society. To volunteer, please send an email indicating specific dates and times you are available to the ISER Office at mail@iser.org by April 26th. PROJECT I: Function of RPGR: RPGR is a ciliary protein mutated in a majority of X-linked RP cases (>75%) and is one of the most common causes of RP in humans. We are trying to understand the function of RPGR and the mode of photoreceptor degeneration due to human mutations in this gene. PROJECT II: RP2 in X-linked RP: The RP2 gene is mutated in 10-15% of X-linked RP cases. Our studies show that RP2 plays crucial and distinct roles in rod and cone photoreceptors. We are continuing to investigate cell-type specific roles of RP2 using animal models. PROJECT III: CEP290-LCA: Mutations in CEP290 are a frequent cause of LCA, a childhood blindness disorder. We are investigating the function of CEP290 in photoreceptor cilia and the mechanism of blindness disorder. PROJECT IV: Therapeutic studies: We are also designing various treatment strategies, such as nanoparticle and viral vector based delivery of correct gene counterparts to all animal models of retinal disease that we have generated and characterized in our lab.